Description: Extremely Cute Children Swing is available now! Metal tubular construction provides stability and durable use. With the tent design , it provides UV protection so that you can let your kids play in the garden. Constructed with tubular metal and oxford cloth, its cradle seat with two Beetle patterns is funny and weight-light. The seat belt can be fixed to your children, ensuring his or her safety. Suitable for child with age from 3 to 5 years old. Beetle pattern design attracts children. Metal tubular construction provides stability and durable use. Tent structures for providing UV protection. Seat belt offers safety for your kids. Easy for assemble and disassemble. Natural material is harmless to kids and environment. Safe Material and Strong Construction - The frame is constructed by metal tubular which is extraordinarily stable and durable. The Canopy is made by 210D Oxford Fabric which features great ventilation property and softness. Considerate Safety Seat Belts - Designed with safety in mind, the seat belts are available for two seats to keep your babies sitting securely and stable. NO WORRY that they might be fall off by accident. 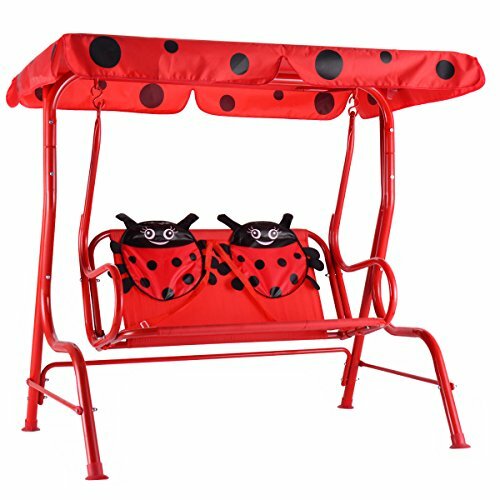 Adorable LADYBUG Theme - The whole swing seat is ladybug themed, which is definitely attractive and appealing for little ones. Sweet Designs - 1. Non-skid feet not only to keep itself stable for security but also to protect floor surface. 2. Lightweight design for easy movement. Your children can move their own furniture to any ideal place without much efforts, which cultivates their manipulative ability. 3.No matter set this swing indoors or outdoors, it brings you and your kids endless happy relaxing leisure time. UV-Resistant & Removable Canopy - Canopy top structure can well protect your baby from UV or sudden shower. It's guaranteed to withstand the elements - rain or shine. The canopy is removable if your baby wants to enjoy sunshine. View More In Porch Swings.